A rich red pattern with Mr. Black Bear prowling through the trees. 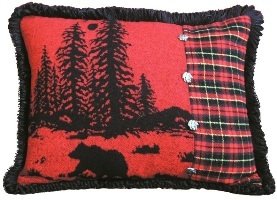 Speciality pillow with black fringe and bear buttons. 20" pillow with poly-fill pillow insert. Item: GWR-P8 Price: $119 ea.